For the Kazakhstani film, see The Wounded Angel (film). 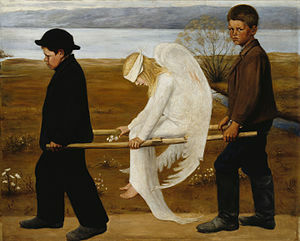 The Wounded Angel (Finnish: Haavoittunut enkeli) (1903) is a painting by Finnish symbolist painter Hugo Simberg. It is one of the most recognizable of Simberg's works, and was voted Finland's "national painting" in a vote held by the Ateneum art museum in 2006. Like other Simberg works, the atmosphere is melancholic: the angelic central figure with her bandaged forehead and bloodied wing, the sombre clothing of her two youthful bearers. The direct gaze of the right-hand figure touches the viewer. The procession passes through a recognisable landscape, that of Eläintarha, Helsinki, with Töölönlahti Bay in the background. The same road still skirts Töölönlahti Bay today. In Hugo Simberg’s time, the park was a popular spot for leisure-time activities among the working classes. At the time, many charity institutions were located in Eläintarha park; in The Wounded Angel the healthy boys are carrying the injured girl towards the Blind Girls’ School and the Home for Cripples. She clutches a bunch of snowdrops, symbolic of healing and rebirth. Simberg himself declined to offer any deconstruction, suggesting that the viewer draw their own conclusions. However it is known that Simberg had been suffering from meningitis, and that the painting was a source of strength during his recovery. This can also be read metaphorically: meningitis is known to cause neck stiffness, lethargy and light sensitivity, each of which is exhibited by the central figure. If read as lungs rather than wings, such a diagnosis even explains the minor injury, as tuberculor meningitis causes abrasions to the upper lungs. When Simberg was asked to paint frescoes for the Tampere Cathedral in 1905–06, one was a larger version of The Wounded Angel, his favorite painting. ^ (in Finnish) Leppänen, Marko: Maalaukseen astuminen – Haavoittunut enkeli Eläintarhassa Esoteerinen maantiede ja periferiaterapia. Accessed 16 April 2010. This page was last edited on 1 October 2018, at 04:10 (UTC).